UNIST visited the Ulsan Community Chest of Korea to deliver $7,436 of donations to support the needy in Ulsan. On December 20, UNIST visited the Ulsan Community Chest of Korea’s headquater to deliver $7,436 of donations to offer help and support to the needy in Ulsan. Administrative Director Kyoo-hwan Kim of UNIST, Han Seok Nam of General Affairs team, and President Gwang-Su Jang of the Ulsan Community Chest of Korea were among the attendees at the donation event, held in the Ulsan CCK building in Namgu, Ulsan, South Korea. 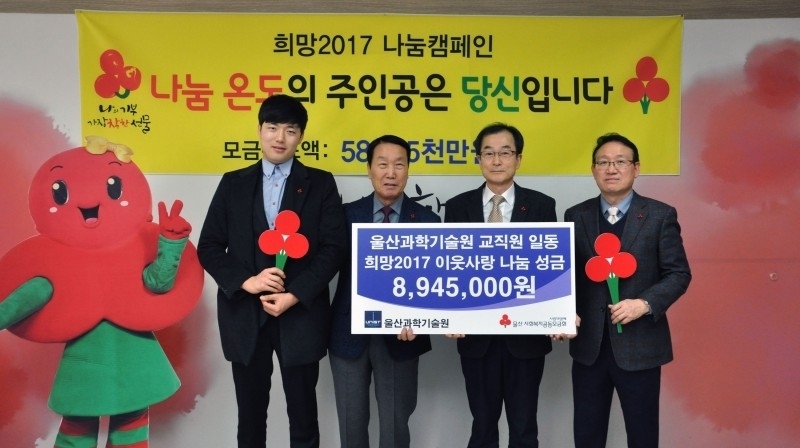 “We would like to thank you for taking time out of your busy schedule to collect and donate your generous grant for the people in need,” President Jang of the Ulsan CCK says. UNIST has been planning, organizing, and participating in a variety of events to help the unpriviledged. In addition to this fundraising, UNIST has recently delivered $3,000 of donations to assist those who were affected by the recent super typhoon Chaba. As part of disaster relieft efforts, members of the UNIST community also visited the devastated area to offer help for flood survivors.